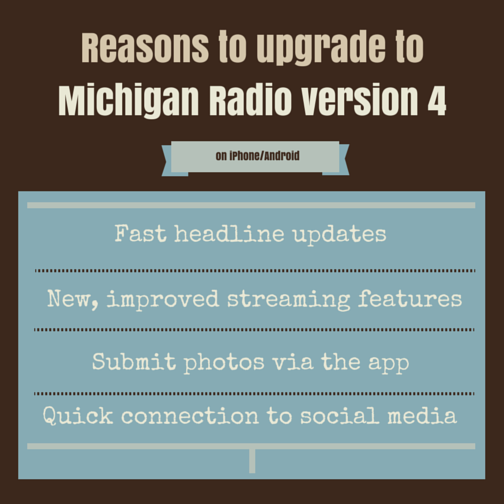 Michigan Radio offers an app for Android and iOS operating systems. To use Google Play to download Android apps, you will need a Google account with Gmail (either Gmail or a Google-hosted domain) associated with your phone or tablet. Michigan Radio has a free app for your Android device, available through the Google Play Store. Note: The Google Play Store app comes pre-installed on supported Android devices running Android OS version 2.2 (Froyo) and above. Launch the Google Play Store from your device. Click Install to install the Michigan Radio App on your device. You can also browse the Google Play website to install the Michigan Radio app. The Michigan Radio app was created for iOS 2.0 or later. It works on iPhone, iPad and iPod Touch. The Michigan Radio app for iOS is located in the Apple App Store under iPhone Apps; it is not listed under iPad Apps. For best results, connect your iPhone, iPad, or iPod Touch to a wireless network before streaming. If you are not connected, you may experience buffering and signal drops if your device uses a 3G or 4G cellular signal. The iPad app, "Michigan Radio + Alarm Clock" for 99 cents is not the free Michigan Radio app. It is an app created by a third party . We do not recommend using it to stream Michigan Radio.